The sky is grey, and they’re calling for a wintry mix today, but I am genuinely excited for this day! I have been sick in bed throughout the weekend, but woke up feeling like myself this morning. After finishing my routine pint of water upon waking, and spending some time with my God, and of course I’m on my second cup of premium grade coffee, I feel ready to tackle this morning’s blog. 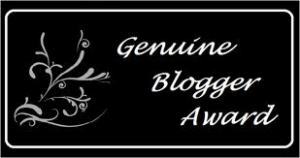 The person who Created this Award has asked that no rules be included if we present it to others, we are free to attach the Symbol for this Award or not. Being “genuine” is an admirable quality, and it seems most of us would describe ourselves in this way. It is being true to yourself, being courageous in the face of criticism, having full self-knowledge. Funny thing is, two years ago I would have considered myself genuine. I was also in the midst of the storm of addiction. I did not know who I was, and molded myself to be who I thought the people around me genuinely wanted me to be. The problem was I didn’t feel genuinely myself unless I was drunk or high. I couldn’t escape the fear of criticism, an inferiority complex dictated my every action. I wanted to be someone I didn’t feel I was capable of being when sober. Thank God I made it through that part of my life alive. Today I not only recognize the strengths of my character, but I am intimately aware of my weaknesses. Who I am may not be society’s ideal for a 26 year old male, but I genuinely like who I am. I read voraciously, I find nature synonymous with my inner life, I love the creativity of gardening and cooking, I have found that I am addicted to relationships/love, I have a burning entrepreneurial spirit that has delayed me from pursuing a “real job”, I have an uncanny sensitivity about me and one of my greatest gifts and biggest weaknesses is my empathy – it is what made me a great nurse, but also what weighed me down emotionally and fueled my need for mood-altering substances. There are potentially a dozen more I could nominate, but I think that will do for now. I am glad to be back publishing again. Thanks to all sent encouraging words my way. So good to hear from you again Troy. Missed you. I am glad to read that you are feeling like yourself again! Being sick is awful and the relief once coming out of it is bliss. I like reading that you like who you are and I admire the fact that you’ve beaten your addiction at such a young age. You do truly seem to be a genuine guy and I appreciate the fact that you maintain this wonderful blog of yours. 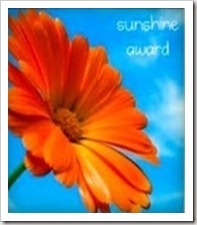 Troy, thank you so very much for the award – it is a great compliment, which a really do appreciate! You got such an amazing concept for a blog! I absolutely love it. Makes me feel like running a marathon or something! Thanks for blogging Troy, You are an inspiration! Troy you have such an amazing story and I’m so glad that you are sharing it with the world. I’m glad I’m getting to know you a little better through your blog; you have a lot to offer the world as someone who is on the other side of addiction. Thank you for acknowledging me through this award, I really appreciate it. Great presentation! I’m checking out your nominees already! Cheers! Take care. Don’t do anything dangerous, OK?